You make me feel so young. We were able to get Elmas' military ID and medical coverage with just the documents in hand, your idea to provide lots of documentation did the trick. Loved the photos and video. Great job you guys! Were able to get the photos on Facebook to all our friends. They all loved the photos except my ex. 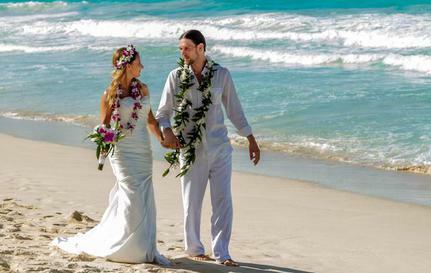 We really enjoyed your service and will highly recommend you to any of our friends wanting to get married in Hawaii. Elmas absolutely fell in love with the island. Looking forward to next year's visit. I thought you might both appreciate this .... I entered our wedding video in the Destination Weddings video contest and WE WON! Gonna use our winnings to buy a new digital camera (as we broke ours on the honeymoon in Hawaii)!! ...Aloha, you folks did our wedding back in 2001 on the Kaneohe Klipper Golf Course, I emailed you on our anniversary this year, and we were wondering if you do family pictures? Like on the beach and outdoors stuff like that, you did such an awesome job on our wedding and no one else can give us quality pics like you guys did. We have done the Sears thing and similar stuff but it just doesnt do it. Let us know what you think, Many mahalos! I am sorry we didn’t get a chance to call you while we were still in Hawaii and since we have been home things have been crazy. It’s starting to slow down and get back to normal now and I have finally had a chance to email you and give you a HUGE THANK YOU! Our wedding was absolutely perfect and it was everything we had imagined and we wouldn’t have done it any other way. You guys are the cutest couple who truly are in love with each other (it is inspiring) and with what you do for a living and it shows! Ryan and I had a great time with you and we were absolutely amazed with the talent you two have with photography and videography. Our pictures were gorgeous and the video was incredible! We both cried the first time we watched it cause you captured everything that we want to remember forever! Our limo was beautiful along with our limo driver, he was great! I didn’t know what to expect with my flowers but my bouquet was the most beautiful arrangement I have ever seen! Our minister was absolutely perfect and his words meant so much to us. I will recommend Hawaiian Eye Weddings to EVERYONE that I hear is getting married cause you guys are truly the BEST! I will never forget you guys and what you did for us and we will be back to visit someday, I promise. You are so lucky to live in paradise and live life to the fullest and enjoy what you do so much. So a huge thank you from both Ryan and I again, you guys are easy to love! could just enjoy our special day!! I just can't say enough about how wonderful you are, and I would recommend your services to anyone wanting the perfect Hawaiian wedding. Thank you for getting everything to us the day after the wedding, before we headed to the other island for the rest of our honeymoon. I had looked at loads of Hawaiian wedding sites but was too scared to book it for myself in case something went wrong. As it happened my Agent in the UK used Hawaiian Eye Weddings to my delight as I thought they were the better one's anyway. When he finally put Leah and I in touch I was so happy at her emails, she was sensitive to our needs, very professional, funny and soon became my best email friend and things soon became personal with us to the point I would cry at some of the things we said to each other (all good of course). Upon meeting Leah it was like meeting up with an old friend I hadnt seen in a very long time, she was lovely. She talked us through everything and stayed with us until we were happy with everything. When I became very nervous and a complete nightmare, my maid of honour called her to see what she could do. Up popped Leah at our hotel, took us to the beach where we were to marry and went through every detail again until I was all calm. On the big day I have never been more calm in all my life and that was all down to Leah and the wonderful Mike. Leah is now like a big sister to me and will be in my heart forever! She and Mike made our day the most moving, relaxing, emotional and funny experience I have ever had how could I ever have doubted Hawaiian Eye Weddings they are the AAAAA team!! Please stop looking when you find them or you will make a mistake in not using them!!!! We are very glad to inform you of this highly complimentary letter from one of your consumers. It was very refreshing to receive it since about 99% of our mail deals with complaints on companies. You may want to consider entering your business for BBB Torch Awards that honors local businesses and public charities for their outstanding commitment to fair, honest, and ethical marketplace practices. More information on BBB Torch Awards is posted online at http://hawaii.bbb.org/torchawards. Thank you so much for the favorable experience given to this consumer. I want to thank you again so much! You have made everything so easy for us, for our wedding, and REALLY wanted you to know just how much we appreciate it. Because Im feeling great, hubbie-to-be is under ZERO second- hand stress, dealing with the 'other' end of things- ie, me. You once mentioned that you had a canadian grandmother, and that virtually made us cousins, and I have to say, that in talking with you, I DO feel like dealing with family- the good, fun-loving family that you look forward to seeing each year! Thank you, Leah, for all that you have done, and all that you will do. You are appreciated, and even tho we haven't met in person, I really, deeply want you to know, just how much you mean to this bride-to-be. We just sat down and watched our beautiful wedding ceremony with Moe and Joanne just now. We were so blessed to have you guys do our ceremony. It exceeded our expectations!!!!!! If there is anywhere we could put in a super positive review for you, let us know. What a great way to end our last day in this Paradise. Leah and Mike are amazing. The minute you meet them you feel genuine warmth and fun. You just know that you will be in good hands. They are both so professional, but with an informality that brought humour and intimacy to our special day, and made us feel so relaxed. They were wonderfully accommodating with our two year old groomsman and other family members. The result was a beautiful video that was real, and perfectly captured our happiness on the day. As an officiant Leah painted a lovely and meaningful picture of the Hawaiian backdrop to the vows that we made, with a smile throughout! The photo album is great. So many memories to treasure. They guided us effortlessly through the photoshoot. We thought that getting married abroad would be complicated, but Leah made the process easy. A few emails and forms to fill in and we were ready to go. Leah took care of everything so we had none of the stress that you normally associate with wedding arrangements. Our wedding day was as special as it could be, and thanks to Mike and Leah we have a wonderful and treasured record of the occasion.